We love the Byron Markets on a super sunny first Sunday of the month. Happy Days customers from Bondi Beach, Newcastle, Merewether, Cooks Hill, Thirroul and the south coast of Sydney got on board. These coastal customers could compare our stainless steel clotheslines with other poor quality products they had endured in the past. Those days are well and truly over! Quality, stylish and durable alternatives just didn’t exist- enter Coastal Clotheslines. Smaller challenging spaces and designer landscaping suit our clotheslines to a T! We can’t wait to see our customers results so keep your eyes peeled on our socials – come on new customers… Instagram and Facebook images will be uploaded soon. 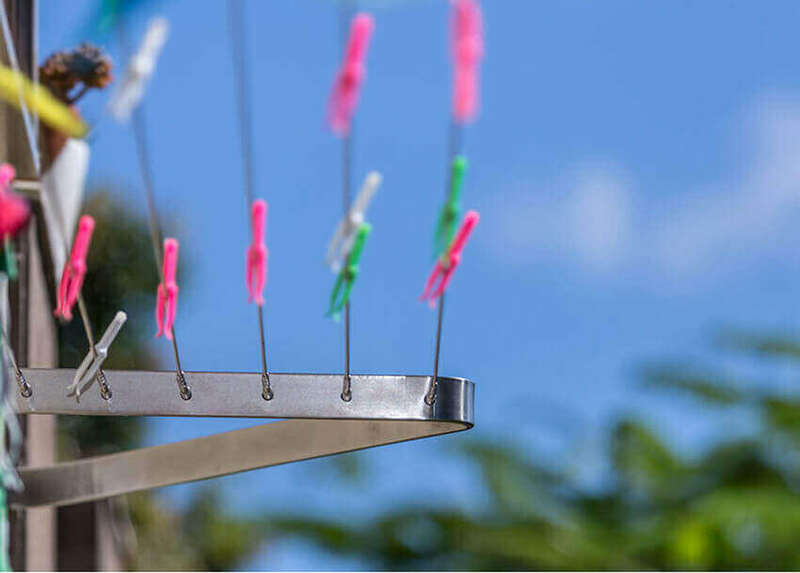 Our DIY ready-made stainless steel clothesline kits put ‘rust on the run’ and give you an easy install. 316 marine grade stainless steel frames, stainless cables, terminals and fittings are no competition for salt spray. Installation is relatively easy. Even I (the female half of Coastal Clotheslines) can put one on a wall, post to post or fence in about 1 hour…not bad for the chicks! The month of May is an all-time favourite for us. All walks of life visit and shop at the markets. We love meeting you, come and say hi to our helpful friendly team & we are happy to help with any further installation or product related enquiries. Our installation service is available in Byron Bay, the Northern Rivers of New South Wales and Tweed Coast, Gold Coast, Queensland. Thanks to our new customers in Peregian, Mooloolaba, Sunshine Coast, Queensland! Enjoy your Australian owned Australian made patented clothesline. Hang out in style at the Byron markets, eat, dance and be merry with a Coastal Clothesline under your arm! Check out our Instagram or Facebook pages, we like to stay social!